Pirates have been a strong interest of mine since childhood. I was gathering data for a long time to make my own pirate roleplaying game. 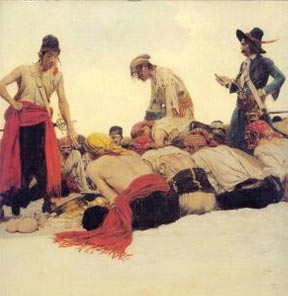 To celebrate Talk Like a Pirate Day I offer hireling articles of agreement. The articles of agreement, pirate articles, always fascinated me. Here was a force of chaos and anarchy that was held together by a sense of justice and a form of democracy (more than the Queen's navy would ever give them). Now, I am very leery of anything that makes dungeon exploration mundane. Tales of the great adventurer guilds of the Forgotten Realms really leave me cold. But I think there is room, in a civilized location (i.e. remnants of empire) for a similar set of expectations agreed upon for hired help. Will obey all orders that don't put themselves or innocents at risk of life, mind, or limb. Unless refusal would interfere with the next tenet. Do their best to protect the hirer and the party's concerns. Keep any gear they are outfitted with. Receive a half-share of treasure found. In the event of death, disappearance, or mental destruction, will have a quarter-share of treasure delivered to their closest kin. "Will not be bewitched with magic other than healing without explicit permission"
"Will get an equal share of available healing magic regardless of faith or god worshipped"
Are there any provisions for a hireling finding, donning and keeping found arms and armor, or does that fall under the 1/2 share of the treasure clause? PS: I love your post. Perfect for the day! Hirelings remains shall be secured and returned for burial(or similar observances) if possible. No remains will be willingly left behind to feed monsters or be animated by hostile magic. I would change the wording to give each hirelings one share, of loot while PCs get two shares each. The math is obviously the same, but the marketing is much better! Thanks, folks. Some good suggestions. @Christian: hirelings have occupied a weird gray area so far in my games: I let players have creative control, until they start doing stuff that I doubt the hireling would want to do, and suddenly I take on the voice of the hireling, objecting. But having a hireling better equipped is in their best interest, so I suspect that might be something a player would be happy to initiate. I'm torn between giving this flavor with archaic language and just making it clear and simple so players understand.